Modern lines – Sleek, contemporary doors are an excellent way to make a statement, especially if you live in an ultra-modern house or a mid-century modern house. Choosing a lacquered wood option that either blends into or plays off of the exterior of your home is sure to draw all the right kinds of attention from both visitors and passersby. Let creativity reign – Who says entry doors have to be solid and boring? If you’re a creative person living in an art-filled home, let your door make an artistic statement of its own. There are a variety of ways to go about this. You can, for example, choose double doors with an exotic design, ask a local artist to create a door for you, or even do something completely unique and create a glass mosaic on your door. The options are nearly limitless. Let the outdoors in – If you reside in a naturally beautiful area, which the Carolinas and Virginia certainly are, consider investing in a front door that features a large pane of glass in the center, offering you an unobstructed view of the scenery that surrounds your home. It will also allow for a lot of natural light in your entryway, which is great if it tends to be dark and dreary. Go Mediterranean – Mediterranean style homes are popular throughout the United States, particularly in upscale subdivisions, such as those that dot North Carolina’s Research Triangle. Heavy, wooden, arched doors inspired by Italian and Greek villas can add a sense of history and authenticity to any Mediterranean-influenced residence. 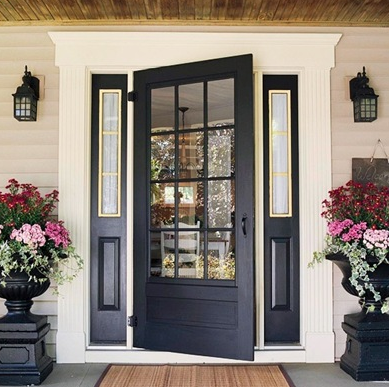 Stay traditional – There is absolutely nothing wrong with sticking to a traditional front door, especially if it fits with the overall style of your house. It is, though, a good idea to take some time to choose a door color that perfectly coordinates with your home. Red doors, for instance, look great with tan homes. You might also want to select your own hardware instead of the handle and lock that come with your door; this is an easy way to personalize even the most conventional entry door styles. The team at Hatch Homes is passionate about helping families all over the Carolinas, and Virginia achieve the dreams they have for their houses. If you are ready to change your home’s exterior, whether it is with a new door or a larger project, we hope you’ll give us the chance to work with you. Call us today to schedule your preliminary consultation.